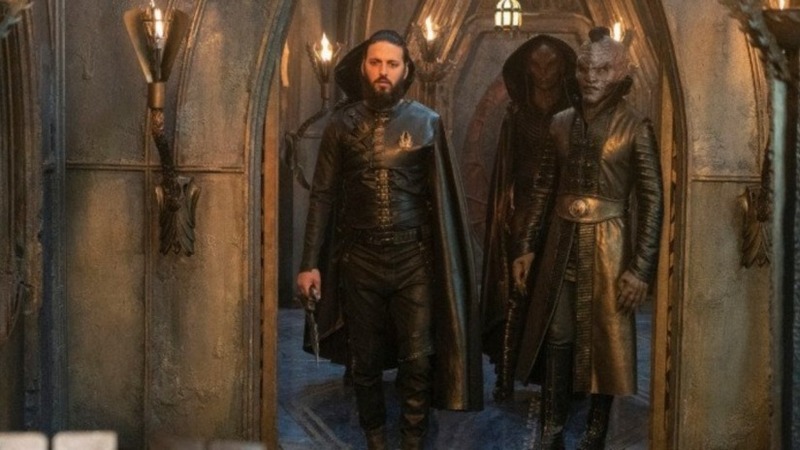 So now we are three episodes into the second season of Star Trek: Discovery and we have the return of Klingon spy Ash Tyler (Shazad Latif) and Klingon chancellor L’Rell (Mary Chieffo). 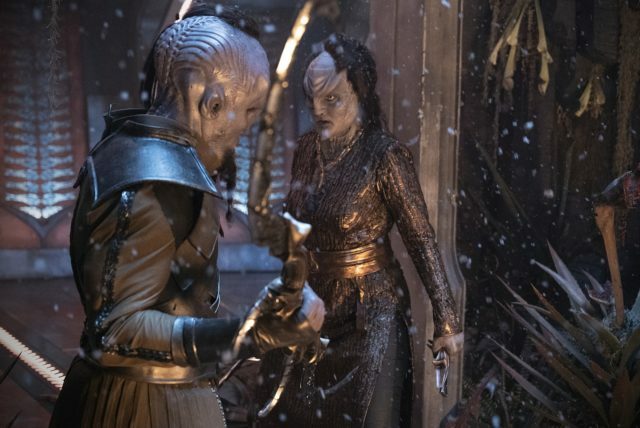 I admit I am a little bit ambivalent about the redesigned Klingons that Discovery went for but the Klingon story in the first season was fairly well-executed so there is no problem in returning to their story. The Tyler/ Burnham doomed love was one of the most interesting facets to the first season. “Point of Light” — Ep #203 – Pictured: Mary Chieffo as LÃÂRell of the CBS All Access series STAR TREK: DISCOVERY. Photo Cr: Michael Gibson/CBS ÃÂ© 2018 CBS Interactive. All Rights Reserved. So here L’Rell is chancellor with Tyler at her side as her second in command but they are under threat from other forces who don’t feel comfortable with a woman ruling the empire. It also comes to light that L’Rell has a secret: she has had a child with Tyler which she has chosen to hide. So the main story in this episode follows them and how they escape the jeopardy they are in. We see the return of a familiar face, Discovery’s former captain Philippa Georgiou (Michelle Yeoh) who steps in in the nick of time to rescue the chancellor and Tyler. 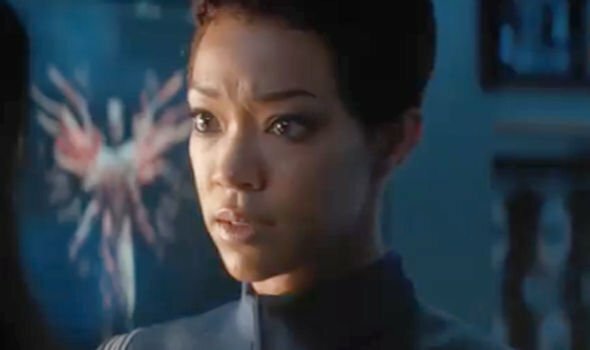 Her appearance also sets up the recently announced Section 31 spin-off, showing that the Federation has a new use for her unique skills. Meanwhile, Michael’s foster mother Amanda Grayson (Mia Kirshner) appears on Discovery to fill Pike and Burnham in on the latest status of Spock. Plus, Tilly (Wiseman) gets to the bottom of her hallucinations as it turns out that rather than a dead schoolmate of hers, it is a sentient fungus that has attached itself to her. Point of Light is perhaps the weakest of the three episodes of the second season so far but it still has enough in it to offer fans of Discovery. The Klingon portion is quite exciting and the Tilly sub-plot is well-handled. The Spock story is taking a little while to come to fruition but hopefully that will be worth the wait. Pike takes a bit of a back seat in this episode, which may be why it suffers a little when compared with New Eden. There is still enough here that makes me want to continue watching it. So a slightly frustrating episode but still fairly enjoyable. Star Trek: Discovery is available now on Netflix in the UK and Ireland and on CBS All Access in the US.